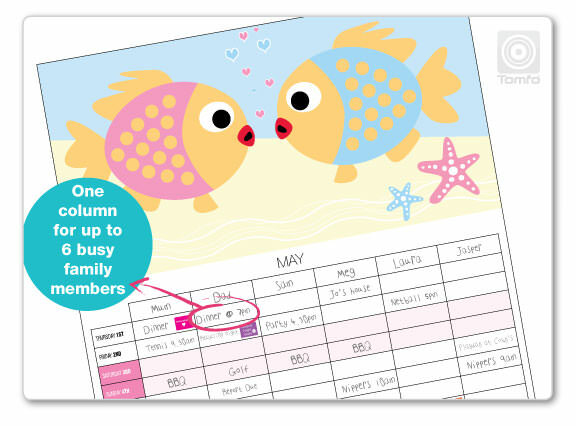 Next years 2015 TOMFO™ (Tomorrow’s Family Organiser) has a grid column format for up to SIX busy family members. So you can see at a glance what everyone is doing. TOMFO™ is the perfect Family Organiser Calendar that will keep you on top of everything that’s happening in the life of your busy family… hang it in the kitchen and you’re all on the same wavelength. The theme for 2015 is Coming soon, with 12 graphic prints and comes with 368 stickers to mark events and occasions such as birthdays, recycling nights, school holidays, public holidays etc. Pictured is our 2014 Theme Ocean Series. Calendars are at a reduced rate for fundraising, at only $20 each they are an affordable fundraising option. Your school or organisation (netball, soccer etc) makes $9 per calendar- ie: sell 100 calendars and make $900 profit for your group. You can download the pre sales order form from here. Once you have collected your orders and monies, place one order by filling out the order form here. We have a poster that you can download to generate sales and interest here. Or get in touch with me here for further information. « Organise your drawers- fold clothes vertically/on an angle!